You just picked the perfect Royal Caribbean cruise for you and your family and it sounds like it will be a blast, but you might be wondering what events, activities and specials may be offered on your cruise. Each evening, your stateroom attendant will deliver to your stateroom the Cruise Compass, which is a daily guide to the news, events and activities that will be occurring on your ship the next day. 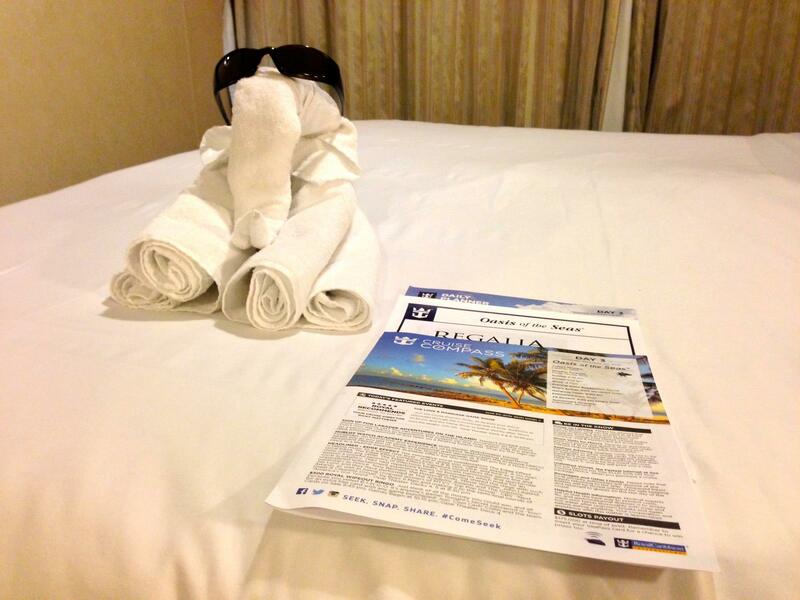 Royal Caribbean packs a lot of things to do into each day and you are best served by reading it each evening to be aware of what is happening onboard. The Cruise Compass is more than just knowing what time bingo is at. It offers you insight into the next day's weather, which bars will have drink specials, shore excursion information and much more. Some events are not repeated while other activities can change daily, so it is in your best interest to track what is happening so you do not miss any of it. Regardless of which ship you are on, the basic structure of the Cruise Compass is fairly consistent. Oasis and Quantum class ships have a slightly different look to the Cruise Compass, but the organization of the Compass remains similar. The first page has an overview of what to expect that day, including where the ship will be (in port or at sea), a weather report, and various specials, offers and events that are highlighted. By far, the weather report in the upper right hand corner is the most useful information on this page. The first page also includes a section of "Important things to know today". It is always good to skim over the list to see if there is anything that stands out. Opening up the Cruise Compass, you will find more events, sales and other offers. The most important part of this page is the "Activity and Entertainment Highlights," which lists the headline show/performance of the evening. Since the evening entertainment is usually the most popular and well-known acts onboard, it is always a good idea to see what performances are scheduled for the evening. In terms of activities listed here, they will all be listed again in the full daily planner, which is coming up on additional pages. Page two is usually best for glancing quickly over it for anything that jumps out as interesting. The third page is an important page for referencing which venues are open and what time. You will get a breakdown of open hours for many areas of the ship, and most importantly, restaurants. On this page you will find the dress code for the main dining in the evening, as well as open hours for every eatery onboard the ship. Knowing when restaurants are open is always helpful, because hours stagger quite a bit. At the bottom of the page, you will find the drink of the day, which features one cocktail that can be purchased at a discount. If you do not have an unlimited alcohol package, this can be a good value. If you read only one page of the Cruise Compass, make sure it is this one because it lists all of the day's activities. Activities are broken down by time of day (morning, afternoon, evening) and provides a chronological list of events throughout the ship. Each event has a time, title and location for quick reference. A great strategy for managing this page is to use a highlighter and mark off any events of interest for easy reference later. You should also know that the activities listing can be teared off for easy reference later on. Many guests will tear them off, fold it up and place in their pocket. Royal Caribbean provides a lot of programming for children and teenagers on their ship. Some events make it onto the regular Cruise Compass, but there are even more events listed in special daily planners just for the kids. Just like the Cruise Compass, Adventure Ocean publishes a Kids Daily Planner for children 3-11 years old. It breaks down the activities lined up for the day while the kids are enrolled in Adventure Ocean. The activities are broken up by ages for easy reference. Teenagers get their own planner too, specifically for kids that are 12-17 years old. The Teen planner is a bit more similar to the Cruise Compass in structure, with a chronological breakdown of events and activities that are just for teenagers. Royal Caribbean does not post or publish Cruise Compasses for upcoming sailings in advance. Nor do they publish their entertainment schedules prior to a cruise. With that in mind, many veteran Royal Caribbean cruisers reference past Cruise Compasses to get an idea of what to expect on an upcoming sailing. There is no way to know in absolute terms what your upcoming Royal Caribbean cruise will or will not offer, but Royal Caribbean insiders will consult past Cruise Compass' to see what was available on those similar sailings to get an idea of what to expect. Generally speaking, Royal Caribbean sailings on a particular ship do not change that much from week to week in terms of the activities or entertainment offered. There will be some discrepancies, but an old Cruise Compass can give you a good ballpark of expectations to plan around. By reading an old Cruise Compass, you can prepare yourself for activities and events that you might want to participate in, such as themed dance parties, sporting events and anything inbetween. You can reference our Cruise Compass archive for a listing of past Cruise Compasses that we have found. 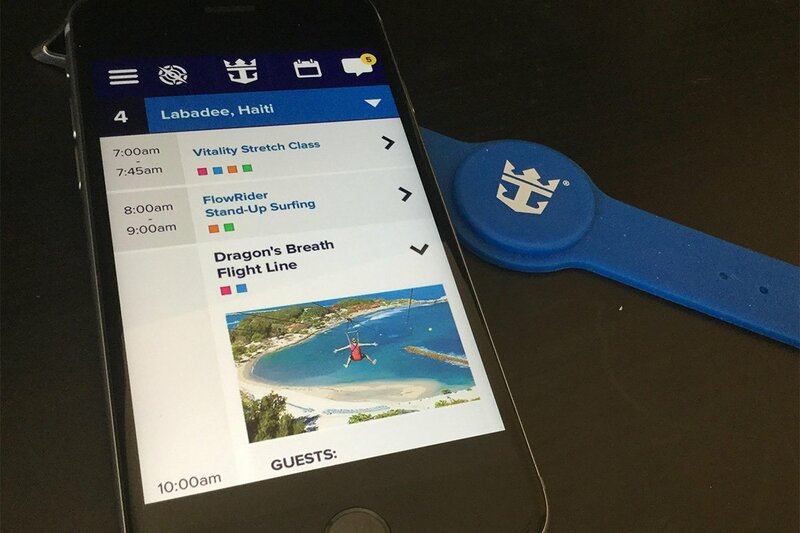 Royal Caribbean's Royal iQ app is available on select ships and has among its features a digital copy of the Cruise Compass. In addition to a listing of everything happening onboard, guests can add specific events directly to their own digital calendar for easy tracking. As you make reservations or add activities directly from the daily Cruise Compass to your calendar, your schedule is automatically updated. Royal iQ only works when onboard Quantum of the Seas, Anthem of the Seas, Ovation of the Seas and Harmony of the Seas. First time cruisers: What clothing do I wear on my Royal Caribbean cruise?